Killer Characters: Camp Wildcat Reenactment...this isn't your Sweet Home Alabama reenactment! Camp Wildcat Reenactment...this isn't your Sweet Home Alabama reenactment! Hi there! I'm so glad you're visiting our little town of Normal. Right over there is where the Camp Wildcat happened between the north and the south on the morning of October 21, 1861. I'm Queenie French the Foundation of Camp Wildcat president. We've been doing the reenactment for years and this year is going to be the best yet. If you take a gander at the map, you'll see you're standing where the red star is located. I know the battle was in the fall, but Colonel Theophilous Garrard had started to form his unit in the spring of 1861. Besides, the weather in Kentucky in the fall is so wonky and unpredictable, I asked the committee to change the reenactment to the spring. Plus, look at this weather. Gorgeous! Granted, the outcome of the reenactment is the same year after year, but I have to say that the actors I've picked this year will be fantastic and on their mark. It takes a lot of skill to drop dead and lay there for an hour or two until the reenactment is over. I know of few of my actors are a little. . .um . . .nervous since Greaser Gadie has escaped prison and they were on the jury. I'd be nervous too if I was a juror and he turned to me and say, "I'm taking a minute to remember your face so when I get out of here I'm going to find you and kill you." But I'm sure he's long gone by now. Right? I mean, if I escaped from prison, I wouldn't hang around to make good on a silly promise. . .would you??? added bonus of recipes and camping hacks. 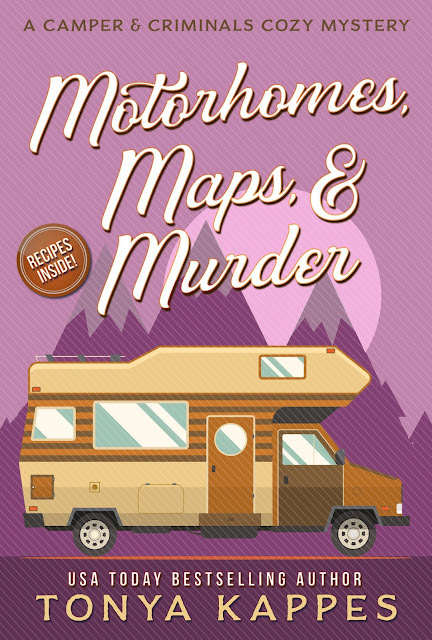 BUY MOTORHOMES, MAPS, & MURDER BY CLICKING HERE! 1. Leaving skin on, cut the banana down the middle without cutting through the bottom of the skin. 2. Open the banana like a taco and add some chocolate chips and miniature marshmallows. 3. Wrap the stuffed banana in foil. 4. Sit the foiled banana on a grate over the open campfire. 5. Check the banana in five minutes and continue to check until the marshmallows and chocolate chips have melted to desired taste. Click here to download the recipe! WINNER WILL BE ANNOUNCED AND CHOSEN ON FRIDAY! I'm ashamed to say I've never been to a reenactment. And I grew up in the birthplace of our nation. Many field trips to Independence Hall, Betsy Ross's house & Washington Crossing State Park. And Washington's Crossing does one every year on Christmas Day. When we lived in the southern part of the state, we often went to the Historic Washington State Park Civil War Weekend Reenactment in Washington, AR. which in fact use to be the state capitol of our state. It's a very small town now, but full of a lot of history. It was always a lot of fun to see how they dressed, cooked and fought battles during that time frame. There are still a lot of buildings (like blacksmith shop, old courthouse and homes) in town from way back when that they give tours on as well to experience how they the rich lived in the time. and it gives an idea of how the town was was as well. 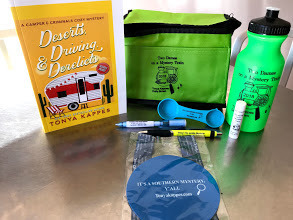 Thank you for the wonderful chance to win a great package including an ARC copy of DESERTS, DRIVING, & DERELICTS which I'm dying to have the opportunity to read! I haven't been to one in many years. I went several times when I lived in Maryland and I went to several when I lived in Europe. I love this series! Thank you for giving away such a wonderful prize package. I have never been to a reenactment but I would love to in the future. I loved Motorhomes, Maps,and Murder! I can hardly wait to read the next book in series! I’ e never been to one. I used to take part. They are very inspiring and exciting. I have been to a couple of Civil War reenactments and it was really interesting. I really liked seeing the encampments where and how they lived during the war. The battle was also interesting to see. My husband & I used to belong to a local historical society near where we live. We'd go see reenactments whenever we could! Sadly, I've never been to a battle reenactment. I think it would be interesting. I've been to a Civil War Reenactment at a state park near me. I've visited a lot of Revolutionary War and Civil War battlefields. I've been to a Revolutionary War Reenactment. I've never been to one - maybe one will be in my future. We've been to a reenactment in Jamestowne, it was amazing! I have. I have had family in them. They are amazing. I have not been to a reenactment, but I'd love to. I have always wanted to and have been close but never made it. I have not been to one but would love to go. I have never been to a reenactment, but I think it would be very interesting, and fun, too. I have visited several "living history" museums/villages in Canada, the US and various places in Europe. I have loved the actors in character at these, so a reenactment should be great. How did you come up with this series? Laulaura.milburn09@gmail. forbattles re-enactments. Loved the history involved even as a child.